The most sacred of all mountains in Japan and a perfect conical vulcano. 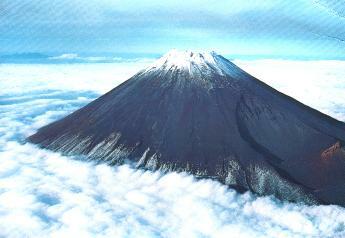 The name 'Fuji' refers to the fire god. Along the way to the top are Shinto shrines, with many little bells and coins left here by Japanese tourists and pilgrims. On the top there also is a shrine with a big bell to ring. On the mountain there are 10 'stages' , each of them having a mountain hut. Many tourists buy a walking stick (with or without bells and/or flag) and have it branded at each stage. A lot of Japanese people do the hike in one day up and down, starting from the fifth station (2380 m), which is the terminal of the bus. An alternative is to stay overnight in one of the mountain huts along the way and to hike up at night and see sunset (goraiko) on the summit (See also in the Japan section Climbing Mt. Fuji). Mt. 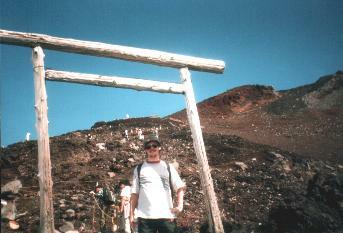 Fuji is the highest point of Japan (3776 m). You can climb Mt. Fuji in July and August.